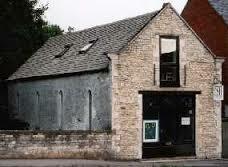 The Cirencester Mission was founded from Fairford in 1885 with the opening of a chapel dedicated to the Immaculate Conception in London Road. Standing alongside the River Churn, the building pictured opposite, is now commercial premises. The foundation stone of St. Peter’s was laid on 20 June 1895 by the Rt. Rev. William R Brownlow, Bishop of Clifton, and was the first that he had laid in the Diocese. The architect was Cannon A. J. C. Scoles, who designed some 20 churches included in the 26 page list of his works in the British Architectural Library. He was the son of architect J. J. Scoles, who was responsible for the London Jesuit church in Farm Street, Mayfair and like his brother I. C. Scoles, qualified as an architect before ordination. The builders were Collins & Godfrey of Tewksbury and Cheltenham and the altar is the work of Boulton & Sons of Cheltenham. Fr. James A. Martin, who served in Cirencester between 1894 and 1906 was Priest-in-Charge of the Mission (parishes came into being only in 1918) and successfully completed the building programme, including the house with ‘not 1d of debt’. As a comparison with today’s building costs, the total cost of the church and house including the architects fee, was just over £22.00! The land had been bought in 1892 for £500, provided by Cannon John Mitchell of Taunton and the Chilean Garcia brothers (former students at the Royal Agricultural College), when E. W. Cripps Esq. of Ampney Parks sold 6 of the 7 acres surrounding Ashcroft House for development. Gifts donated by parishioners in the 1930’s include the stained glass lancet windows behind the reredos depicting the founding of the church, a processional cross, a reliquary and a jewelled chalice. The small side altars with statues of the Sacred Heart and Our Lady with the infant Jesus date from just before the Second World War as do some of the benches from the chapel of the former Our Lady’s Convent in Chesterton (1936-73); the remainder of the benches were made in the early days of the War. The stained glass window in the organ loft was installed in the mid 1950’s. 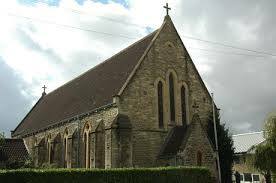 The church celebrated its centenary in 1996 with, as its climax, Consecration by the Bishop of Clifton, Rt, Rev. Mervyn A. Alexander, on Saturday 5 October. Extensive refurbishment took place in the proceeding years. Redecoration included a ceiling stenciled with motifs of intertwined S(aint) P(eter) and is crossed keys copied from a more elaborate earlier design. A new stone altar (enclosing relics of St. Alphonsus Liguori founder of the Redemptorists) and English oak lectern stand in the recarpeted sanctuary. A new English oak organ loft from is decorated with carved shields of two Bishops of Clifton, Rt. Rev. W. R. Brownlow (1830 – 1901), who opened the church and M. A. Alexander (1925 -) who presided at its consecration, flanked by those of St. Peter and the Town of Cirencester. The Original Organ was a tracker-action late Georgian organ dates from around the end of the 18th century. It was inaugurated in March 1993 and was to restored to its original condition when funds permitted. Since the summer of 2011 the church has replaced the Organ with a new state of the art digital instrument Roland C380 with two manuals and pedals. The C-380 will impress every organ player. With its authentic sound and outstanding playability, the keyboard feel and pedal touch make playing the C-380 a thoroughly enjoyable experience. It’s equipped with many features and comes with a stylish dark oak cabinet finish. The design is compact, lightweight and space saving. Instant switching between classical tunings, baroque pitch etc. Thanks to its lightweight, space-saving cabinet and the attractive, elegant Dark Oak finish, the C-380 can be used in many different locations. It’s perfect for churches and concert venues as well for your home so you can practise at your convenience. 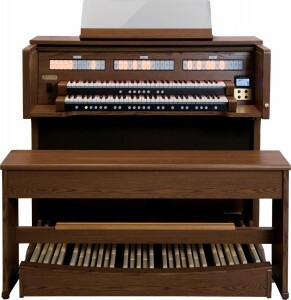 The C-380 is provided with RSS (Roland Sound Space) ambience system giving the rich, full sound of a pipe organ. Thanks to this technology you can choose a ‘virtual’ room size, wall type and reverb depth to create the realistic acoustic of a cathedral, church or concert hall. This environment can also be created in your home. Two satellite speakers are included with the C-380 which, when installed on a wall or ceiling, create the natural soundscape of a real pipe organ. Enjoy the authentic tracker touch, allowing you to feel at one with the organ. You will experience the satisfaction of playing at a real pipe organ thanks to the acclaimed 61-note tracker-action keyboards (from the Roland C-330) and the 30-note parallel concave pedal board. Each speaking stop of the C-380 controls three different voices (Voice Palettes) covering a wide range of taste and styles from the Baroque era through to the large romantic organs of the 19th and 20th centuries. The C-380 contains USER Coupler functions, which combine your choice from a palette of organ and orchestral sounds with the C-380’s own stops. This allows you to create hundreds of different sound combinations and then store them on the organ’s memory pistons. With C-380 you can practise by playing along with preset songs that are built into the organ, or with performance data that you have recorded from your own playing. When playing a song you can individually mute the performances of a specific division (MAN I/MAN II/ Pedal) or even play back with a softer tone. You can also use the metronome and practise day or night thanks to the headphones output. The three stained glass memorial windows were installed between about 1935 and 1997. The records sometimes contain little information about the donors and the artists but as much as has been discovered in the archives end elsewhere is given below. The windows are described in the chronological order of installation. The stained glass in the three lancets at the (liturgical) east end of the sanctuary depicts the founding of the Church with Christ’s words from St Matthew’s gospel (Matt. xvi. 18) ‘thou art Peter, and upon this rock I will build my church’. This text was taken by Bishop Brownlow for his sermon at the laying of the foundation stone on 20 June 1895 and later by Fr Bilsborrow from Lechlade at the celebration of the Golden Jubilee of the church on 29 June 1946. The window was donated in memory of George Murphy, a former shopkeeper of Gloucester Street, Cirencester who died on 11 February 1934. He may have been a descendent of Mr. Augustus Murphy. a former manager of the local gasworks, who was a prominent member of the St Peter’s Building Committee. No details of the artist or maker of the window have been found. This three-light ‘Immaculate Conception’ window embodies a view of the present church but the name recalls the earlier Chapel of the Immaculate Conception of 1855 in London Road, of which the now-converted building still exists alongside the River Churn. It was donated in the mid-1950s in honour of his deceased mother by K Terence McHugh, a well known local land agent and surveyor, who had been a boy chorister at Westminster Cathedral. The window is by Francis Tucker of London, once a well-known name in ecclesiastical furnishing, but attempts to learn more have been unsuccessful. This recently-installed window with two lancets and a quatrefoil depicts Saint Maximilian Kolbe, a Polish priest arrested at the outbreak of the Second World War end deported to Auschwitz Concentration Camp where he was branded 16670. Prisoner 16670 offered himself as a substitute for one of the ten prisoners chosen to die by starvation as a reprisal for an escape from the camp. In the starvation bunker Fr Kolbe continued his priestly ministry, leading prayer and singing, until he became the last to die, resting against the cell wall, his face calm and radiant. He was beatified in 1971 and canonized by his compatriot Pope John Paul II in October 1982. The window by a well-known artist, Graham Dowding of Nailsworth, is in memory of three sisters – Lucja, Zuzanna and Teodora Szmidt – and Lucja’s husband Bronislaw Barzycki. The sisters ware arrested in 1942 and deported to Concentration Camps – Pawiak, Majdanek, Ravensbruck and Buchenwald – from which they were freed after the defeat of the Axis powers. Lucja’s husband, Bronislaw. fought In the Warsaw Uprising before imprisonment by the Germans in a prisoner-of-war camp. The family settled in Cirencester after Poland lost its sovereignty at the end of the War. The window was commissioned by the children of Lucja and Bronislaw Barzycki, Elizabeth and John, who chose the subject of St Maximilian Kolbe because it so closely identifies with the family history and the devastating effects of the Second World War on the Polish nation. Installation was completed on 24 April 1997 and the window was formally blessed by Fr John Blacker, Parish Priest of St Peter’s, on Whitsunday 18 May 1997. The relics placed in the altar of this church during its consecration on 5th Oct 1996 are of St Alphonsus Maria de Ligouri (1696-1787), Bishop, Doctor of the Church and founder of the Redemptorists, patron saint of confessors and moral theologians. Born near Naples of a noble family, he received a doctorate in both civil and canon law at the age of sixteen. After eight years as a barrister he became a priest, concentrating his apostolate on parish missions and hearing confessions. In his preaching and spiritual distinction, he aims at simplicity, gentleness and intelligibility. He was Bishop of Saint Agora de’Goti for thirteen years, resigning because of ill health. He combined the academic life with that of the apostolate, producing sixty works on moral, dogmatic and spiritual theology – books written in addition to his labours as missionary, religious superior and bishop, having made a vow never to lose a moment in idleness. Among his best-known ascetical works are The Glories of Mary and Visits to the Blessed Sacrament, of which there were forty editions in his lifetime. During his latter years he suffered great physical pain and spiritual distress but maintained an intimate sense of the presence of the suffering Christ.